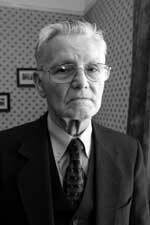 Veteran republican Frank Morris died peacefully at his Donegal home on Sunday, 4 June after a long illness. He was 86. A large crowd attended the funeral in County Donegal. Originally from Greencastle, County Tyrone, Morris was the last man in Ireland to receive lashes from the brutal and infamous 'cat-o-nine-tails'- an implement of torture that was used by the British and the unionist regime on defenceless prisoners in the Six Counties. Frank Morris joined the IRA in 1942. During this period he helped two IRA volunteers to escape across the border after the shooting of an RUC man in Dungannon. Returning home, he was involved in a gunfight with the RUC near the Strabane/Lifford border crossing and was later captured by the B-Specials. Morris refused to recognise the court and was sentenced to ten years in jail and 15 lashes of of the whip. Speaking to the Daily Ireland newspaper about his ordeal last year, Morris said: "The pain was dreadful, you couldn't imagine it. The tail ends of of the whip cut my flesh to the bone and I bit my lip to stop screaming." Morris also spent 18 days on hunger strike in Belfast's Crumlin Road Jail before being released after serving seven years. Former Sinn Féin MP for Mid Ulster Tom Mitchell delivered a graveside oration for his former comrade. Sinn Féin West Tyrone MLA Barry McElduff, who was a personal friend of Morris said of him: "I was struck by the number of republican veterans that came from many parts of Ireland to pay their last respects. Frank was described by many of them as his own man and was an outstanding Irish republican who was highly respected. "He was a great family man and made a success of his grocery business. He was the sort of man who was successful at anything he turned his hand to." Frank Morris is survived by his wife Mary, and children Eilish, Blanaid, Branain, Fintan, Joe and Trea.